STRATFORD — When a team is able to take advantage of its scoring opportunities, it usually comes out on top. 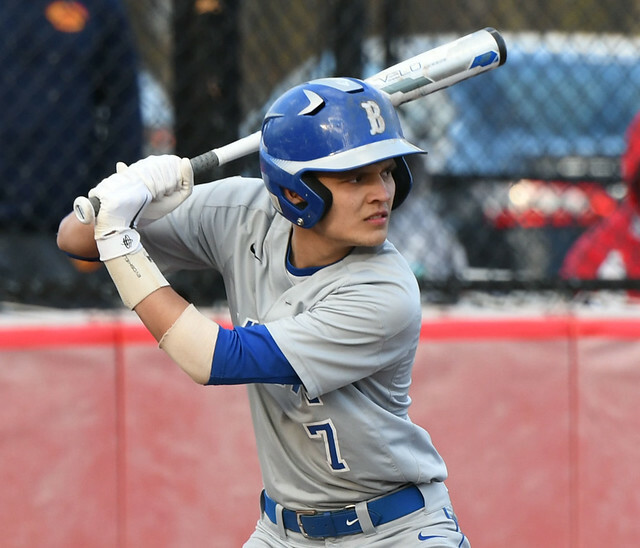 That’s exactly what the Bunnell baseball team did in its game against cross-town rival Stratford, scoring three unearned runs in the second inning while riding the arm of lefty Henry Gloria en route to a 6-1 non-league victory on a windy Monday afternoon at Penders Field. Roper’s bases-clearing double gave Bunnell a lead it wouldn’t relinquish, and Gloria outdueled fellow lefty Zach Fedak. Gloria, a junior, pitched seven-hit ball over 6.2 innings with six strikeouts, two walks and he hit one batter. Lopez said his lefty ace was phenomenal with the way he threw strikes and was able to get ahead of batters. The Bulldogs grabbed a 3-0 lead in the second off Fedak (5 IP, 2 ER, 6 hits, 6 Ks, 3 BB), who Lopez said threw the ball very well. Justin Herrera led off with single to right. After a strikeout, Gloria walked but Fedak recorded another strikeout and it appeared he may escape the jam. Pierce Barnum reached on an infield error to load the bases and set the stage for Roper, who laced a 1-2 pitch to deep center for a double. “I was thinking I just got to hit the ball,” said Roper, a senior who plans to play at Mount St. Mary (NY) next year. “Coach (Brian) Caselli told me to control my heart rate so I had to stay composed to drive those runs in. Stratford head coach Mick Buckmir said it was a disappointing loss and his team needs to clean things up but he also gave credit to Gloria for pitching a great game. “We gave them too many opportunities that inning and they cashed in,” he said. The Bulldogs tacked on a run in the third, on an RBI base hit by Brett Batka, and added another run in the fifth, thanks to an RBI single by Herrera, to take a 5-0 lead. Stratford got a run in the bottom of the fifth to cut the lead to 5-1 but the Red Devils could have had more. Malcolm Kinder led off with a single and Luke Zezima walked. Logan Zezima’s shallow fly ball to center, that looked as if it might be caught, dropped in but Bunnell turned an 8-6-5 double play. Logan Zezima eventually scored on an RBI single to center off the bat of Gabe Avila. Braydon Seaburg walked and R.J. Burlone reached on an infield error but the baserunner at third was cut down after a rundown between home and third. Bunnell rounded out the scoring on a sacrifice fly by Roper in the sixth. Records: Bunnell 5-2, Stratford 2-4. Batteries: B—Henry Gloria (W, 2-0), Andrew Verkoved (7th) and Justin Herrera; S—Zach Fedak (L, 1-2), Malcolm Kinder (6th), Zach DeManche (6th) and Anthony Torreso. 2B: B—Cullen Roper, Josh Kusinski, Colin Richards; S—Zach Fedak.